Please plan to meet with your advisor prior to each semester’s registration appointment time to avoid delays in scheduling. Registration begins in November for the Spring semester and in April for the Summer/Fall semesters. Appointments are generally scheduled in ½ hour increments. (Walk-in advising is only offered during the first week of the fall and spring semesters on a first-come, first-served basis in 15-minute increments. Please check with the advising office at the beginning of the semester for available walk-in hours). Newly admitted transfer and returning students may schedule an appointment by calling (414) 229-4763 during listed office hours to be scheduled with an Academic Advisor. Prospective new students and prospective transfer students should visit the admission page to review information including audition/portfolio requirements. Additionally, you are encouraged to meet with Lori Sieckert, Recruitment Coordinator, to discuss our programs and opportunities further. Appointments maybe be scheduled by calling (414) 229-4763. Academic Advising is a process of educational collaboration that empowers students to realize their maximum educational potential. The goal of academic advising is that students will gain a clearer understanding of themselves as an individual and the experience of higher education. This goal is achieved through the challenge and support offered by Academic Advisors to engage students in critical thinking about academic decisions, meaningful discussion about personal values and goals, identification of strengths and challenges, and reflection about academic/social behaviors as they relate to the student’s overall success at the university. Both UWM and the PSOA set high expectations for each student to act in ways that fulfill their potential as a scholar, performer, and innovator, always in the context of a supportive environment. Therefore, the ultimate responsibility for making decisions about life goals and educational plans rests with the individual student. Bring a list of questions or concerns you want to talk about. Figure out what you liked and didn’t like about your last semester. Spend some time thinking about your current and future goals. Be open to your Academic Advisor’s feedback. Be honest about yourself and your expectations. Accept responsibility for your academic plans and decisions. Schedule and follow through on regular advising appointments. Arrive at advising appointments on-time and ready to share information about progress and/or obstacles. Make yourself aware of pertinent policies, procedures and requirements through use of PSOA website and university website and/or visits with appropriate offices on campus. Develop positive relationships with faculty, staff and fellow students. Regularly read and respond appropriately to all university correspondence sent to you via U.S. mail or e-mail in a timely fashion. Take advantage of all resources that will improve and enhance your educational experience. Challenge yourself by trying new academic experiences to further articulate values, goals, and interests. ctively engage yourself in university activities to become a part of the UWM community. Take time to reflect on both positive and challenging academic experiences to think about ways to better enhance your educational career. Appreciate and respect your uniqueness, demonstrated through positive and open dialogue. Ask questions and seek information to glean information about your academic progress. Engage you in conversation to find deeper meaning in your college experiences. Support your decision-making process to guide you towards an academic path which enhances your overall capabilities for success. Challenge you to find new ways of thinking about knowledge and how your personal goals and values align with your academic experiences. Encourage you to find methods to become involved with the university beyond the classroom walls. Assist you in understanding the purpose and potential of higher education. Assist you in developing academic/career plans consistent with your goals, interests, and abilities. Refer you to additional resources when necessary or appropriate. When do I need Academic Advising? All students are encouraged to meet with an Academic Advisor regularly throughout their academic careers, with a minimum of one meeting per semester. New freshmen: Must meet with an Academic Advisor for a Mandatory Freshmen Conference during the mid-point of their first semester at UWM. Academic Probation: All students on academic probation (cumulative GPA below 2.0) must meet with an advisor regularly (more than once per semester) to monitor their progress. If the student is within the first 4 semesters of enrollment at UWM, the student will also be assigned a First Year Probation hold. Prior to course registration the student must schedule an appointment with their advisor to remove the hold. Re-entry after a one-semester or four-semester drop: Students who were academically dropped from the university but are now eligible for re-entry must meet with an Academic Advisor to remove academic holds preventing registration. Students who been dropped and have not attended UWM for one semester or more must also re-apply to UWM prior to meeting with their advisor. The mission of the PSOA Office of Student Services is to provide quality academic advising in an environment that fosters honesty and respect. We are committed to building partnerships with students, providing services/resources that enrich their college experience, and empowering them to develop and succeed in their educational goals. As Academic Advisors in the Peck School of the Arts we value building partnerships with students that will foster their artistic and educational growth; we are also committed to providing quality academic advising through a collaborative environment where our interactions with students, faculty and staff foster a positive partnership. New Student Orientation (NSO) is a required experience for all incoming students to introduce you to the UWM campus, as well as to other new students and families. More information about the general university portion of orientation and requirements to attend, including registration in advance of the event at uwm.edu/studentorientation. How do I attend NSO? You must register for NSO in advance through the Student Success Center and then attend the event in order to have your registration hold lifted. To remove the credit agreement hold, please follow the steps listed in PAWS in the financial section. Students considering transferring into the PSOA should contact an Academic Advisor as early as possible. Early planning is key to ensure that your courses will not only transfer into our curriculum, but will also help towards the sequencing of classes for an on-time graduation. Some programs have specific requirements for the transferability of required major courses, and some universities do not offer the courses needed in the major. Therefore, to ensure timely completion of your degree, early communication with the PSOA is important. We understand that some students may transfer to the PSOA for a variety of reasons, whether for financial reasons, personal/family reasons, or perhaps because you started at a different college/university that no longer fits your goals. The Academic Advisors want to help you with the transfer process to ensure the transition is smooth and you are well-prepared for your first semester on our campus. How do I gain admission into the PSOA? Visit our Admissions page and explore the requirements for your intended program. When should I transfer to the PSOA? Many courses have specific sequencing; early transfer ensures you will stay on track with your graduation timeline, ideally after no more than 2 full-time semesters. How do I have my courses evaluated for transferability? Submit an official transcript to the Registrar’s Office from each university you have attended. 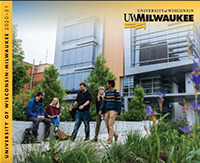 Once your credits are evaluated, they will appear on your UWM transcript in PAWS. How will I know if my credits will transfer? Utilize the Transfer Databases available through the Registrar’s Office. This will allow you to see transfer equivalencies that have been set-up for specific schools. For specific questions regarding transferability of courses not listed on these sites, contact the Registrar’s Office using their online form. Meet with your Academic Advisor to understand how your transfer credits will be utilized within the required curriculum of your program. Your advisor may in turn consult with the appropriate faculty to determine use of transfer credits within your track of study. You will be assigned an Academic Advisor based on the first letter of your last name. Call (414) 229-4763 or visit Theatre 120 to make an appointment. Once your transfer credit is posted to PAWS, schedule an academic advising appointment to learn what courses in which you will need to enroll. We recommend meeting with your advisor in the spring to plan for the Fall semester. It is not advisable to wait until the summer months to begin this conversation. Some majors also assign a program advisor with whom you will consult for department specific courses (Dance, Theatre, and Musical Theatre). I have applied to UWM and the PSOA. What’s next? I am a new incoming freshman; how do I register for courses? All incoming freshman must register for New Student Orientation and complete the Admitted Students Checklist. You will register for courses at orientation. I am a transfer student; what’s next? Plan to meet with your Academic Advisor as soon as possible. Please register for the Transfer & Adult Student Orientation (TASO). How do I know the classes in which I should register? It is advised that you review your curriculum sheet with your Academic Advisor to see which classes you need for your major. You should also consider if you need to be full-time for financial aid. You are encouraged to read all of the details related to a given course including course pre-requisites and course fees, while making sure that all sections of the class fit into your schedule. I am graduating next semester; what should I do? Schedule a meeting with your Academic Advisor prior to the start of your final semester and visit the UWM Graduation page for other important information. There is a problem with my academic requirements in PAWS. How do I fix it? The Peck School of the Arts is in the process of updating the PAWS Advisement Report to accurately reflect degree requirements. It is highly encouraged that you schedule a meeting with your Academic Advisor to discuss your degree requirements before you begin your final semester; please rely on your curriculum worksheet from these meetings. Consult the Registrar’s Add/Drop Calendar before taking an action, and then consult with your Academic Advisor with questions or concerns. Contact the Financial Aid office before making credit changes between part-time (11 credits and below) and full-time status (12 credits+). What should I do if I missed the course add or drop deadline? Schedule an appointment with your Academic Advisor to consult on the situation. PAWS won’t let me enroll in a course. What should I do? Learn about changing your class schedule. Depending on the program that you wish to pursue, this may or may not be able to be changed by your PSOA Academic Advisor. If you are interested in a major offered through the PSOA, research the degree programs online through the PSOA website and then schedule an appointment with your Academic Advisor. Please be aware that many PSOA majors require either a portfolio review or an audition to be declared in the major. Check the PSOA website under your area of interest to see specific portfolio or audition details. If you are interested in a major offered through a different school/college at UWM, please contact that specific academic advising office to learn more about the degree requirements and how your credits will be utilized in the curriculum. What is a waitlist and why would I use it? Refer to the One Stop Student Services site for more information and consult the Wait List Frequently Asked Questions. What can I do if I am having problems in class and need additional assistance? First, schedule an appointment with your Academic Advisor to discuss the problem. You should immediately explore tutoring, which is available for many classes on campus, such as math. Visit the PASS website for additional information about resources available to you. Additionally, the Writing Center is a resource that can be utilized for all stages of writing. Visit the One Stop Directory for further resources. What happens if I am on academic probation or if I have been dropped from the university? If you have been dropped from the university, or would like more information about academic probation, visit the Transcripts and Verifications page. Where I can find more information about UWM’s academic misconduct policy? If I have concerns about a grade or a concern about a class, what should I do? Discuss the concern with your Academic Advisor. Concerns relating to grades and classes will likely pertain to the Grievance Procedures Policy. What are my FERPA rights which protect my education records as a student at UWM? UWM does its part to keep your information safe. Under FERPA, the Family Educational Rights and Privileges Act, you have options for sharing and protecting your information. Where do I go if I might need accommodations for a class (learning disabilities & ADHD services, blind/visually impaired services, etc.)? Contact the Accessibility Resource Center (ARC) right away at the start of the semester, even if you do not think you will plan to utilize the services. How do I stay informed about important campus information? Check your UWM email every day. Most administrative offices will use UWM email as their primary communication route. It is your responsibility to stay abreast of official university communications. We also recommend you bookmark the PSOA event calendar and like the PSOA Facebook page. How do I engage in activities beyond the classroom walls that enhance my educational experience? It is expected that at some point during any student’s career there may be some bumps along the road. Your Academic Advisor is a good starting point to work through these issues, in combination with many of the resources listed below which can also bolster your academic experiences to help strengthen your overall experience as a scholar at UWM. Many of UWM’s resources are available through the One Stop Directory. View more Peck School of the Arts Student Resources.